Awesome post from the Beijing International Book Fair! How awesome is this? My CEO at the Beijing Book Fair with my books! This entry was posted in Uncategorized on August 30, 2013 by Sherrill S. Cannon. Great note about Manner-Man from a Grandmother! This entry was posted in Uncategorized on August 29, 2013 by Sherrill S. Cannon. This entry was posted in Uncategorized on August 27, 2013 by Sherrill S. Cannon. SBPRA mentions Gimme-Jimmy’s Silver Global eBook medal in its Success Stories! I also discovered that there are some other mentions there… SBPRA authors are doing well!!! This entry was posted in Uncategorized on August 22, 2013 by Sherrill S. Cannon. Do you know anyone who has a problem with sharing? Do you know anyone who seems selfish? If so, this is the perfect book for them. Jimmy is nicknamed, by the kids at school, Jimmy-Gimme because whatever he wants, he just says Gimme! He then takes it from wherever it is at OR from whoever has it! His daddy tried to talk to him about it but Jimmy did not listen nor obey. However, one day Jimmy encountered a big problem…then bigger….then even Bigger! This has a bit of the fantastic in it but it definitely gets the main point achieved. It is all accomplished through rhyme to enhance the child’s thoughts and direct them toward poetry. Rhyme is an easy way for children to learn and memorize. The illustrations, by Kalpart, are truly wonderful and clear. These are books which need to be in every pre-school and elementary school library. They should also be in every home where there are toddlers and young children. This entry was posted in Uncategorized on August 19, 2013 by Sherrill S. Cannon. 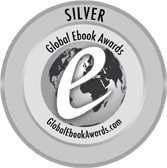 Gimme-Jimmy wins Silver Medal in Global eBook Awards! Congratulations Silver Medal Winner of the 2013 Global Ebook Awards! This entry was posted in Uncategorized on August 17, 2013 by Sherrill S. Cannon. Thank you to Graham Manning for this Tweet! This entry was posted in Uncategorized on August 13, 2013 by Sherrill S. Cannon.